A university instructor, who has been conducting research on church attendance in America, has found that people who become born-again Christians do not start going to services significantly more often than before. Ryan P. Burge, who teaches American institutions, public administration, and international relations at Eastern Illinois University, studied various data from the Cooperative Congressional Election Study panel that was conducted in 2010, 2012 and 2014. Burge outlined some of his major findings in a blog post on Monday, and found that there was little movement among Protestants or Catholics across the four-year time period, with nine in 10 maintaining their membership. The instructor pointed out that the various denominations in America enjoyed a relatively stable level of attendance in the studied period. “Of the 9,500 individuals to take part in the panel study, a staggering 62 percent reported the same level of attendance in 2014 as they did in 2010,” Burge wrote. “Attendance is highly stable, but the number of people who are attending with less regularity is nearly 10 percent more of the population than those who are attending church more regularly. This is not good news for the local church,” he added. Even when looking specifically at those who converted and became evangelicals between 2010 and 2014, the findings do not change significantly. “One would assume that an individual ‘giving their heart to Jesus’ would show some evidence of their religious behavior changing and would likely attend church at a much higher rate after becoming a born-again Christian. However, the data does not confirm that assumption,” he outlined. “Of the 9,500 individuals in the survey, 300 of them became born again from 2010 to 2014. Of that group, half (154) did not change their religious attendance at all. Of the remaining 146, 96 (33 percent) started attending church more frequently, but 50 (16.7 percent) actually attended church *less* after claiming a born-again status,” he added. Overall, the data showed that only 1.6 percent of individuals in America became born-again and started attending church more often in the time period. When exploring the factors that are potentially keeping people away from attending church more frequently, Burge noted that politics has increasingly been dividing American society, including the church. He pointed to other research done by political scientists, such as Paul Djupe, Anand Sokhey, and Jake Neiheisel, that shows that Democratic-leaning believers are more likely to leave their churches if they perceive that the majority of the congregation is made up of Republicans. The instructor also referred to a New York Times article published earlier in March, titled “A Quiet Exodus: Why Blacks are Leaving White Evangelical Churches,” which conveyed the stories of racial minorities who often feel excluded in white majority churches when politics come into discussion. Looking back at the Cooperative Congressional Election Study data, he found that believers who were attending church a lot less in 2014 compared to 2010 were more likely to be closely aligned with the Democrats. “Put another way: if 100 individuals were attending church much less in 2014 than 2010, 70 of them did not change their political affiliation while 19 became more aligned with the Democrats, and 11 became more aligned with the Republican party,” he positioned. Burge clarified that it is “crucial to note that this analysis does not establish a causal relationship,” and that he cannot say if politics is the primary cause of church exodus for people moving to the left. “While larger discussions are occurring about the population is moving around the religious landscape, it appears that one constant for each of them is their frequency of attendance. It seems the old adage is true here: ‘old habits die hard,'” he concluded. Other research on born-again believers, such as survey results released by the American Culture & Faith Institute in December 2017, also found a troubling landscape. The data showed that there has been a trend of decline since 2010, with now only 31 percent of U.S. adults stating that they are born again. 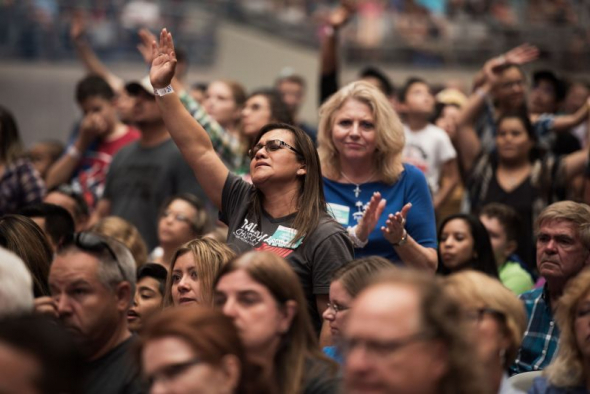 What is more, only a minority, or 39 percent of the born again category affirmed that they have a strong personal responsibility to share the Gospel. “Fewer churches emphasize and equip people for evangelism these days, and the results are obvious and undeniable. The implications of ignoring gospel outreach — especially among children, who are the most receptive audience to the gospel — are enormous,” warned researcher George Barna at the time. “All the ‘church growth’ strategies in the world cannot compensate for the absence of an authentic transmission of the good news of what Jesus Christ has done for humanity,” he said.